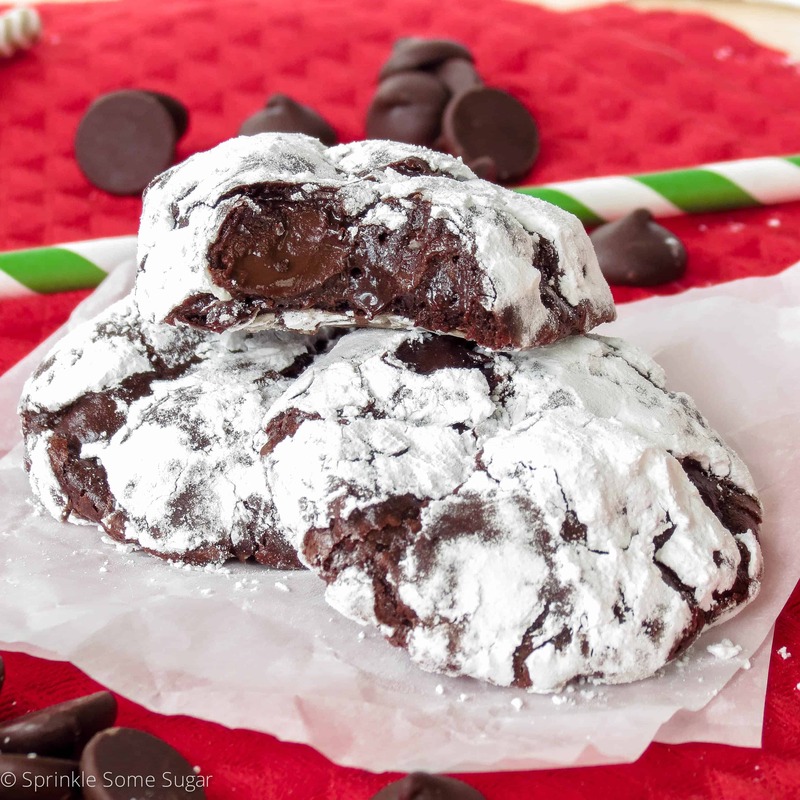 The gooiest, meltiest, chewiest chocolate cookies that have ever existed! Warning: After making these, your family and friends may possibly send you death threats for not making them on every single occasion. No, seriously though, my boyfriend’s, sister’s, fiance (that was mouthful) literally threatens my life if I don’t make these for him when they come over! He already put in an order request for Christmas Eve this year for these to be made. These are one of my favorite cookies too because they are really just pure chocolate, gooey goodness! Chocolate lovers, unite! The inside of these cookies will stay a bit gooey even when set, BUT, straight out of the oven they are OMG worthy. Gooey and delicious. To obtain the gooey texture the day after or so, just pop them in the microwave for 10 seconds and they’re right back to their fresh-out-of-the-oven amazingness. The outside has a thin, slight crispness and then you bite inside and it’s like BAM. Almost like a molten lava cake in cookie form but not as messy.. obviously. They are incredible! The greatest part about these cookies is that they are so easy to make with only a few ingredients that you most likely have on hand! They are a little messy to roll but trust me, it’s worth it in the end. Just look how pretty they are. And those CENTERS! Side note: Did anybody watch SOA last night?! OMMMMMMMMMGGGGG. Talk about emotional freaking roller coaster the entire episode. I might go into a depression next Tuesday after the series finale so if you’re noticing I am gone for a while.. you know where to find me: in my bed sobbing with a gallon of ice cream. Back to these cookies though, I’ve been making them for what feels like forever now and everyone always goes nuts over them every single time so I just know you’ll love them! Also, these are perfect for holiday gifting! In a medium-sized bowl, whisk cocoa powder, 1 cup powdered sugar, cornstarch and salt together making sure there are no lumps. Set aside. In another bowl (microwave-safe), place 1 cup of chocolate chips and melt in microwave in 30 second increments until smooth. Set aside to cool slightly. In the bowl of your stand mixer fitted with the whisk attachment, whip egg whites until stiff peaks form, about 3 minutes. Switch to paddle attachment and slowly mix in 1 cup of powdered sugar until smooth. Add cocoa mixture and mix until combined. Pour in warm melted chocolate and 1/2 cup chocolate chips and stir until completely combined. Dough should be very stiff and thick. If it's not, let it rest for a few minutes without touching it and it will stiffen up. Place 1/2 cup powdered sugar in a small bowl. Roll 2 rounded tablespoons of dough into a ball and roll in powdered sugar as thin or thick as you want. Place on prepared baking sheet and repeat this process with remaining dough. Bake cookies for 9-10 minutes but no longer than 10 minutes or they will burn. They will look underdone, but that is how they are supposed to look. Allow them to cool on baking sheets for about 5 minutes or until able to be easily removed without breaking. 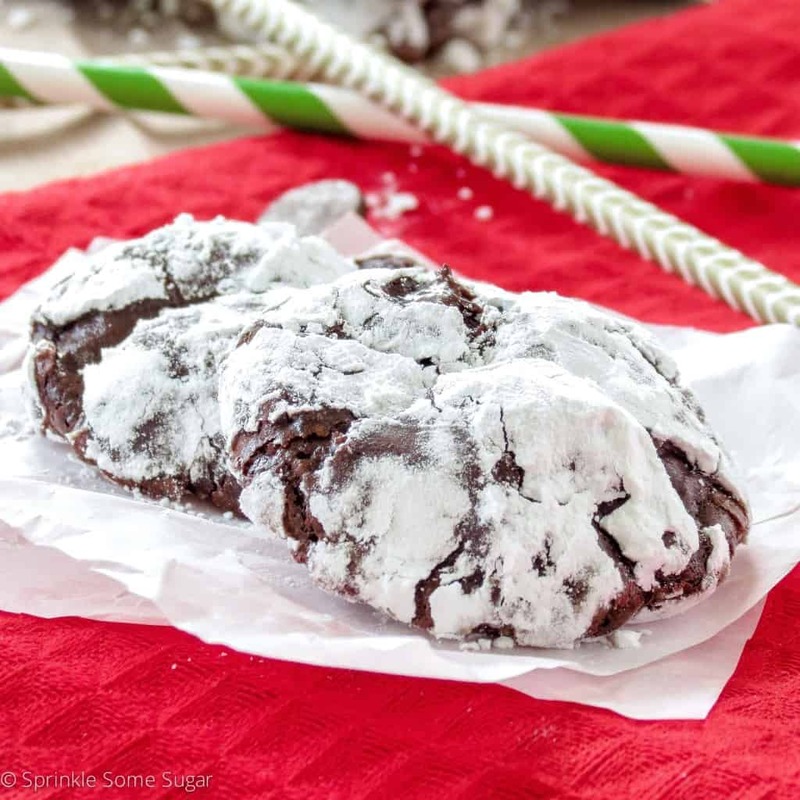 Gooey Dark Chocolate Truffle Cookies will stay fresh for up to 4 days. They will stiffen up on the second day, so if you want them gooey like they are when they are fresh out of the oven, pop them in the microwave for 10 seconds and they're good as new! Thank you for sharing this recipe! Your cookies turned out really well, and looks like it’s fairly easy to make them, too. I think I can almost smell the chocolatey goodness from the screen yum! These cookies are perfect to give as presents to workmates, friends and family members for the holiday season. Just by looking at them, I know the taste and texture are perfect. I love chocolate truffle cookies. They also look easy to do. Thanks for the recipe! Firstly these look awesome, delicious and everything you need in a man (cookie) hahaha no seriously they look so delicious thanks for the recipe I want to try them myself before christmas I think they would rock my mother’s christmas table. Now what is SOA? Firstly, can I just say, how you’ve presented these cookies makes them look so unbelievably delicious! Secondly, I absolutely love chocolate truffle so I REALLY want to try these! I’ll have to pin these and have a go at baking them for Christmas. Finally, yes I did watch SOA, I’ll be sad next week when I don’t get to see handsome Jax anymore and more people most likely die – seriously, how much death is in that show! Thanks for making me hungry! I liked it so I put a pin on it! This looks so delicious and the pictures you too were beautiful for it. Wow I definitely need to recreate this as this looks like a savory sweet treat! Oh my goodness, it’s 6 am and I want some dark chocolate truffle cookies for breakfast now. Thanks for sharing your recipe. I love trying to make new things and I really like trying to make new things that are chocolaty good. Wow! I just started baking and I haven’t mastered the chocolate chip cookie recipe yet. But once, I got the hang of using my oven, I will definitely try this. “A little messy to roll” is an understatement! My cookies definitely didn’t look as pretty as yours. They are very easy to make and crazy rich! Definitely need some milk to go with. These look fabulous! Could you refrigerate the dough overnite. If so, it would make for warm a.m. Office cookies! Hmm, I’ve never tried! The dough will probably get VERY hard so you will have to let it sit out at room temperature for 30-40 minutes to be able to work with it. Hi! Your cookies look amazing!! I tried out the recipe though but the dough never stiffed up, and when I put them in the oven they came out a little hard and crunchy more than gooey. Do you have any idea why? I did everything in the recipe exactly as it says. Thank you!! I have not so I am unsure how it would turn out! If you test it out, please let me know. Have you ever made these ahead and frozen them? Or is it possible to freeze the dough and pull out and bake later? I haven’t, but I think freezing the dough may be okay. Personally, I would just make it fresh since it comes together os quickly.